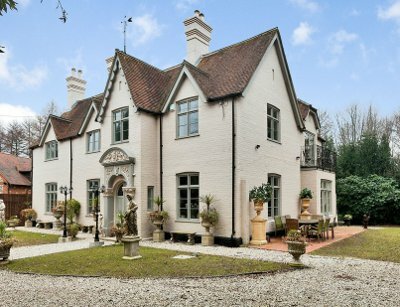 For a lovely holiday with friends in Buckinghamshire, have a little look at Woodside House in Cadmore End. Located near Stokenchurch, and only 40 minutes by train into our great capital city, Woodside House sleeps 14 people in 6 bedrooms. Woodside House sleeps 14 people in 6 bedrooms, with the bedrooms being made up of 5 double bedrooms and 1 twin bedroom. Two of the double bedrooms have an additional bed for additional sleeping arrangements. Woodside House has a drawing room with a TV, Victorian fireplace and mini grand piano. There is a kitchen/breakfast/dining room with TV, double height stone fireplace, breakfast island and granite worktops. You also have a cinema room with TV (which seats 8 people). And there is a small gym for you to use. Woodside House has Wi-Fi too. The open fireplace is in full working order, so you can spark up a fire on a cold night. There is also gas central heating too - with the costs of the gas & electricity all included in the price of your holiday. Your bed linen and towels are also included. There is a large, lawned, garden, with seating. Woodside House also has plenty of parking available. The Chilterns are easy accessible form Woodside House, with some great walks directly from the manor house. You could even bring your bikes with you and explore some the area by cycle. Marlow and Henley are the place to head for an explore along the Thames Path; and for those with an eye for a bargain, head on over to the Bicester Village shopping outlet. High Wycombe, Milton Keynes and Windsor are all within driving distance of Woodside House. For those with children in tow, you may want to consider a day out at Legoland. Should Woodside House not be to your liking, but you fancy staying in the area around Stokenchurch, you might well be interested in the cottages below. All these cottages are within a few miles of Woodside House.